Rossland’s Simon Hillis drops into Link’s Line at Red Mountain Resort to impress the judges at the Canadian Open Freeskiing Competition. Mountain kingdom preteen youth excelled in the Canadian Open Freesking Championships presented by Sony Action Cam (COFSC) held at RED Mountain Resort Jan. 21–24. 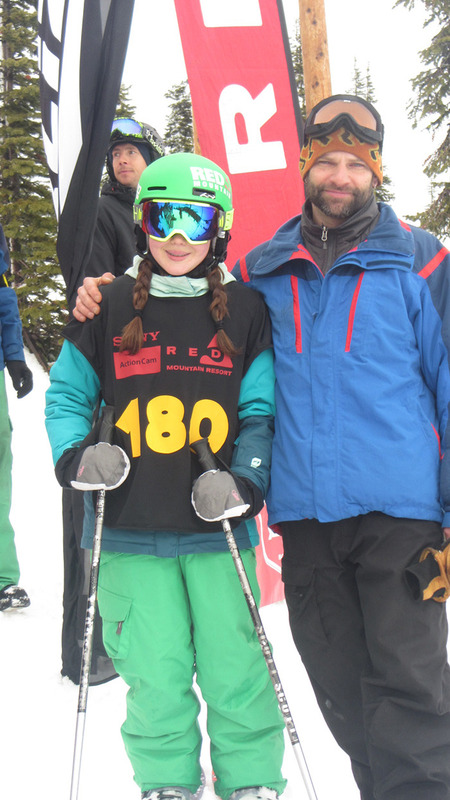 Rossland’s Erin Flood and Xander Banks each won top place in their division. Flood won the female seven to 11 category while Banks nudged ahead of Rossland’s Bodhi Kuhn to win the male seven to 11 category. Kuhn was awarded second place of the 21 athletes in his category. This competition was an International Freeskiers and Snowboarders Association (IFSA) national tour stop. Junior competitors in the age categories of under 12, 12-14 and 15-18 battled it out for the opportunity to compete in the junior world championships to be held at Grandvalira Andorra this February. Judges Jeff Holden, Brian Coles and Luke Nelson were impressed by the 158 competitors from across North America who took part in the 17th annual competition. “It is impressive to see some of the boys skiing like men,” said Coles. The Canadian open Freeskiing Championships at RED is the longest standing junior Canadian event. “RED has supported junior freeriding from the beginning taking the event seriously, treating the athletes well and it shows. Everybody knows this event is special,” said RED’s events and marketing manager, Nicole Briggs. Link’s Line and Papoose Bowl on RED’s Granite Mountain made for a superb venue for the three-day competition. “Link’s line at RED is in the upper echelon of freeride venues. Link’s has a sustained fall line riddled with technical features and a solid vertical drop. Link’s is an ideal venue located directly under the lift,” described Briggs. Mother nature could have been kinder for the athletes, judges and spectators who had variable snow and visibility throughout the duration of the competition. Thursday’s qualifier event kicked off under blue skies but the cloud rolled in shortly after fogging the view of the course. Judges left their station at the base of the course and split up over the circuit to enable them better viewing of competitor style and tricks. Friday’s qualify saw the judges on course all day while Saturday’s visibility was more favourable. This enabled the judges to once again be stationed at the base and for the finalists to ski more aggressively, providing them with better sight of features to leap from. This event brought together the freeskiing competition community, emphasizing personal growth and development through healthy decision-making and creative expression. The IFSA has worked to enhance the sport of competitive big mountain freeriding by creating a uniform set of guidelines to ensure consistent and credible competition. The results, including results for the 29 local Rossland junior athletes and more information is available at www.canadianopenfreeskiing.com.